Hilaritas Press grew out of a desire to keep the books of Robert Anton Wilson in print and to fulfill Bob’s wish to provide for his children, something that during his life was difficult when authors typically receive less than ten percent of the money generated by their work. 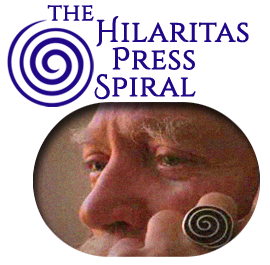 Bob’s daughter Christina and his friend Rasa, directing enterprises of the Robert Anton Wilson Trust, created Hilaritas Press as a way to fulfill Bob’s wishes and insure that his legacy remains robust. We’ve enlisted the aid of a small group of Bob’s treasured friends and others who are advising and helping out the Trust on RAW related matters. Bob would have loved that. Throughout his life he generously gave thanks and returned support for the many people who were touched by his heart, humor and wisdom. Bob said that he first got the word hilaritas from Ezra Pound’s Cantos which was quoting the Byzantine philosopher Gemistus Pletho who said “you can recognize gods even in their human form by their outstanding hilaritas.” Bob notes that in Pletho’s time, hilaritas meant “cheerfulness, good humor we would say, but not in the sense of always joking.” For many years Bob would often sign his letters, and then emails with “amor et hilaritas”, or simply “hilaritas”. After editing, reformatting and publishing Bob’s books in eBook and Print editions, a huge task that will take us a while, Hilaritas Press will invite other adventurous authors to become members of the Hilaritas Press family. Stay tuned to this internet channel for more details! After a trip to Mexico and a visit to a local silversmith, Robert Anton Wilson was forever after seen wearing his large spiral ring. The Hilaritas Press spiral replicates the design of Bob’s ring. Bob’s ring now sits in the offices of The Mgt. inspiring the RAW Trust in all its endeavors. The percentages indicated in the bar graph above signify some aspect of our perception of the variables, or they are the result of throwing several sets of dice, or they are an attempt at dramatic optimism, or they were chosen for their aesthetic arrangement, or the whole thing may be entirely random (although the latter is doubtful because of the involvement of a human brain). Bob explains the Eight Circuit Model of the Brain in this amazingly good 7 part interview.